Who, What, Why: What is the Little Red Book? Shadow chancellor John McDonnell threw a copy of Mao's Little Red Book at George Osborne. What exactly is the tome all about, asks Jon Kelly. "Let's quote from Mao" is not a remark that's commonly heard in the House of Commons, but McDonnell said he did so as a joke to draw attention to sales of British assets to the Chinese government. Picking it up, the chancellor replied mockingly that it was his shadow's "personal signed copy". It's an icon of China and communism as well as a work of propaganda. More than a billion copies have been published, making the book, often wrapped in its distinctive vinyl cover, one of the most widely produced of all time. During China's "Cultural Revolution" it became virtually mandatory to own and carry one. The Little Red Book - or, to give its full title, Quotations from Chairman Mao Zedong - contains 267 aphorisms from the Communist Chinese leader, covering subjects such as class struggle, "correcting mistaken ideas" and the "mass line", a key tenet of Mao Zedong Thought. Included is Mao's famous remark that "political power grows out of the barrel of a gun". Originally produced in 1964 by the People's Liberation Army - an early version was titled 200 Quotations from Chairman Mao - it soon became a key feature of the leader's personality cult. The Ministry of Culture aimed to distribute a copy to every Chinese citizen and hundreds of new printing houses were built in order to achieve this. 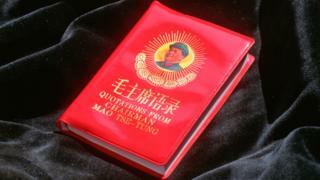 Mao himself reportedly liked its resemblance to books of quotations by philosophers such as Confucius. During the Cultural Revolution, in which millions were persecuted or killed, owning it "became a way of surviving", says Daniel Leese, professor of modern Chinese history and politics at the University of Freiburg. Paramilitary "Red Guards" mobilised by Mao to purify the Communist Party would check whether those suspected of bourgeois tendencies were carrying it or whether they could quote from it. As the regime attempted to export its ideas as a form of "soft power", millions of copies were published in translation and sold abroad. It was taken up by Western radicals such as the Black Panthers and passed around as a samizdat text in the Warsaw Pact nations, where the USSR's split from China ensured it was banned. Mao's successor Deng Xiaoping disliked the book and tried to suppress it, says Leese, but this only served as a kind of "viral marketing". While its appeal today may be nostalgic or even kitsch, McDonnell's stunt may have temporarily boosted its British sales - since his speech, the Sun reported, left-wing bookshops have sold out of it. "Every Communist must grasp the truth: Political power grows out of the barrel of a gun." "All reactionaries are paper tigers. In appearance, the reactionaries are terrifying, but in reality they are not so powerful." "A revolution is not a dinner party, or writing an essay, or painting a picture, or doing embroidery... A revolution is an insurrection, an act of violence by which one class overthrows another."